Solder Free for Quicker, Easier Installation. 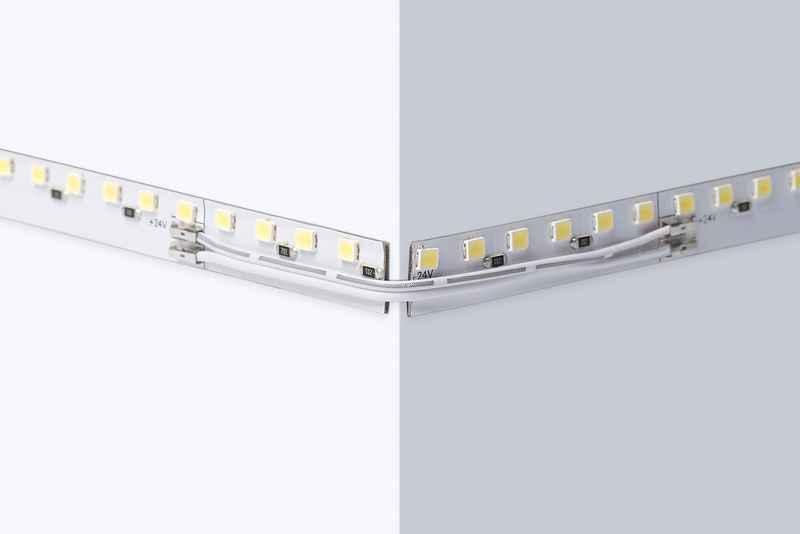 A revolution in LED strip design -HaloLED DB2 has been created with you, the user, in mind to make installation & maintenance both quicker and easier. The on-board connectors mean that soldering or connection systems become a thing of the past - just strip the cable, twist the wire and push into the on board connector! Corners are no longer a problem - it doesn't matter whether the strip is mounted flat or vertically, just mount the strip on the walls, align the edges near the corner and complete the corner joint using a piece of solid core wire which is easily pushed into the connectors. This produces a neat and simple finish with no twisting or bending of the LED Strip. 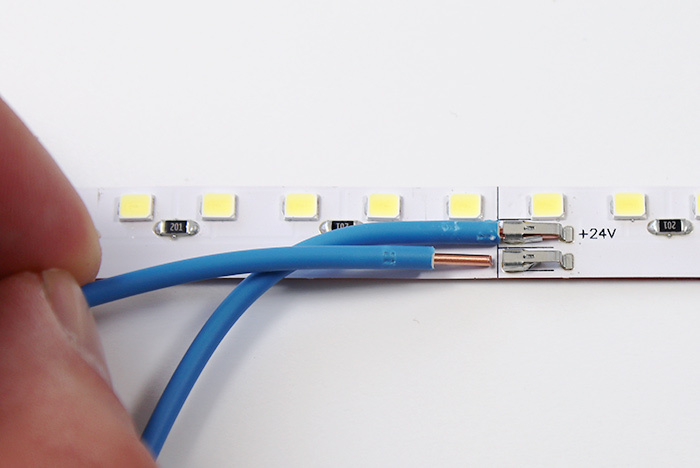 The offset LED's mean that the cables can be run along the face of the HaloLED DB2 Strip without interfering with the light or, alternatively, you can choose to introduce power anywhere along the length of the strip - it really is that easy. In the unlikely event of a problem with an installation, then HaloLED DB2 is easier and quicker to repair. There's no need to remove the whole length, just cut out the affected section, add a new piece in the gap and then reconnect the power using simple wire links. The on board connectors mean it is a few minutes work and there is no need to disturb the rest of the length saving you time and money. The basic strengths of the ProStrip range remain - that is a heavy duty PCB for optimised thermal control and a generous 10m single run length as well as the excellent 3M VHB (very high bond) adhesive tape to provide a lasting adhesive joint with no delamination, to provide the complete package. Reliability and long term performance are guaranteed with a lumen maintenance figure of > 96% after 6000 hours of use. The on board connectors are easiest to use with a solid core cable - we stock a 0.75mm 2 core in 2m packs (code 19-75-2-SC). It is possible to use a 0.5mm or 0.75mm stranded cable but please ensure the cable ends are well twisted and there are no free strands which might cause a short circuit. You can also use solder free GRIPPA connectors - these are better if you wish to use a stranded cable - part code GRIPPA-SW-10-IP20. ProStrip DB2 is fully dimmable using 0-10v, DALI & DMX protocols and is compatible with lighting control systems such as RAKO, Lutron and Crestron (requires appropriate interface) or use our HaloLED control system - an integrated room scale lighting control system offering zonal control and scene setting with a choice of control types including a smartphone APP.